WHAT ARE THE BEST CULINARY SCHOOLS IN THE UNITED STATES? Interest in food science has grown in recent years because of the increasing awareness of the vital role of food in the health, well-being, and economic status of individuals and nations and people's curiosity and desire to try new and innovative food dishes. Food science is the study of the chemical composition of food and food ingredients; their physical, biological and biochemical properties and and the interaction of food constituents with each other and their environment. This week the area of cooking know as Molecular Gastronomy got a major endorsement with the publication of a six volume culinary work from a group of chefs, scientists, engineers and food writers was led by former Microsoft Chief Technology Officer, Nathan Myhrvold. The work which weighs in at 40 pounds and contains 1,500 recipes covers areas such as: Culinary Movements Through History, Physics of Food and Water, Pressure Cooking, Microwaving and Frying, Sous Vide Cooking, Thickeners, Foams, Gels and Wine. While several methods in Molecular Gastronomy may be out of the reach for the home cook, there is plenty of room for creativity in the home kitchen. 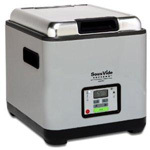 Sous Vide Supreme now comes in a demi-version at half the price. 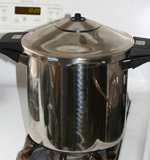 Pressure cookers are a great tool to prepare stocks. 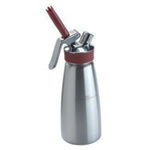 Create Professional Foams using the iSi Foamer. Food Nutrition and Information Center -- The Food and Nutrition Information Center (FNIC) at the National Agricultural Library (NAL) has been a leader in food and human nutrition information dissemination since 1971. Bertand Simon, Sciences can help us with better cooking articles in french.